The food and beverage industry has and is likely to continue showing a heavy support for the global xanthan gum market in terms of demand. Moreover, the expansion of the food and beverage industry into a greater variety of convenience foods is expected to boost the global xanthan gum market even further. Another key driver for the global xanthan gum market is the inherent superiority of xanthan gum to other hydrocolloids. However, current restraints experienced by the global xanthan gum market include the reinforced anti-dumping policies by the U.S. and other developed economies on the import of these products from Austria and China, along with the overall mistrust of quality of xanthan gum supplied by China, which is the leading producer in the market. The global xanthan gum market is expected to expand at a very positive CAGR of 7.7% in terms of revenue, between 2016 and 2024. This revenue is expected to reach as much as US$1.25 bn by the end of 2024, after being calculated at US$651.5 mn at the end of 2015. In terms of volume, the global xanthan gum market is expected to expand at a CAGR of 7.3% for the above forecast period. The key end users of the global xanthan gum market include the industries of food and beverage, oil and gas, pharmaceuticals, personal care, and other minor end users such as lab research prospects and agrochemicals. The extremely high use of xanthan gum in the food and beverage industry is spread across the areas of bakery and confectionary, dairy and ice creams, meat and fish, beverages, and sauces and dressings. The global xanthan gum market’s overall volume-based demand has predominantly been led by Asia Pacific. In 2015, Asia Pacific took up 35% of the market’s global share in volume. Furthermore, this region is expected to show a phenomenal rate of growth in demand for xanthan gum over the coming years, primarily due to the massive demand for it in China. In terms of countries, China, the U.S., and Canada have been the leaders in consumption rate of xanthan gum. Key players in the global market are currently looking at emerging economies especially from the Asia Pacific region to improve their revenue generation. Countries such as India along with the leading consumer of xanthan gum – China – are expected to show a very high requirement for it in their food and beverage industries. Based on the key regions, Asia Pacific followed by North America are expected to be very beneficial areas for players in the global xanthan gum market. The demand for xanthan gum is expected to mature soon, while Latin America and the Middle East and Africa are expected to show a slower growth in demand. Of the various end users in the global xanthan gum market today, the food and beverage industry trumps the rest in terms of demand and scope of use. In 2015, the food and beverage industry alone was responsible for the consumption of over 50% of the xanthan gum produced globally. The food and beverage sector is likely to continue being a highly attractive end user for the players in the global xanthan gum market due the importance of this ingredient in several types of products within the food and beverage sector. Xanthan gum is especially in high demand by the manufacturers of sauces and dressings, followed by the manufacturers of dairy and ice creams. The top names associated with the global xanthan gum market currently include CP Kelco, Fufeng Group Company Limited, Cargill, Inc., Archer Daniels Midland Company, The Aurora Chemical, Jungbunzlauer Suisse AG, Hebei Xinhe Biochemical Co., Ltd., MeiHua Holdings Group Co., Ltd, Deosen, DuPont-Danisco, The Zoranoc Oilfield Chemical, Solvay S.A., and FMC BioPolymer. Xanthan gum is a polysaccharide derived from a bacteria called xanthomonas campestris through a pure-culture fermentation process. The xanthomonas campestris strain used to yield xanthan gum is non-pathogenic and non-toxic to animals and humans. Therefore, it is preferred over other substitutes in food applications. Xanthan gum is primarily employed in end-user industries such as oil & gas and food & beverage. Demand for xanthan gum is expected to increase significantly in the next few years considering the favorable regulatory policies regarding its use in food and beverages. Asia Pacific and North America dominates the xanthan gum market in terms of production and demand. Countries such as the U.S, Canada and China are expected to be the key consumers of xanthan gum during the forecast period. Antidumping duty on imports of xanthan gum from China and Austria is anticipated to hamper the market growth. Increasing demand for gluten-free products is estimated to offer major opportunities to the xanthan gum market in the next few years. This report analyzes and forecasts the market for xanthan gum at the global and regional level. The market has been forecast based on volume (Tons) and revenue (US$ Mn) from 2016 to 2024, considering 2015 as the base year. The study includes drivers and restraints of the global xanthan gum market. It also covers impact of these drivers and restraints on demand for xanthan gum during the forecast period. The report also highlights opportunities in the xanthan gum market at the global and regional level. The report includes detailed value chain analysis, which provides a comprehensive view of the global xanthan gum market. Porter’s Five Forces model for the xanthan gum market has also been included to help understand the competitive landscape in the market. The study encompasses market attractiveness analysis, wherein end-users are benchmarked based on their market size, growth rate, and general attractiveness. 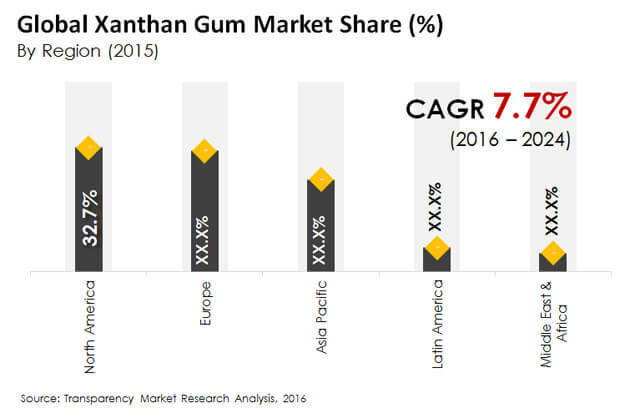 The study provides a decisive view of the global xanthan gum market by segmenting it in terms of end-users such as food & beverage, oil & gas, pharmaceutical, personal care and others (including agrochemicals, lab research, paints and printing inks). The food & beverage segment is further bifurcated into: Bakery & Confectionery, Dairy & Ice cream, Meat & Fish, Beverages and Sauces & Dressings. These segments have been analyzed based on present and future trends. Regional segmentation includes current and forecast demand for xanthan gum in North America, Europe, Asia Pacific, Latin America, and Middle East & Africa. The report provides the actual market size of xanthan gum for 2015 and estimated market size for 2016 with forecast for the next eight years. The global market size of xanthan gum has been provided in terms of volume and revenue. Market volume has been defined in tons, while market revenue is in US$ Mn. Market numbers have been estimated based on key end-users of xanthan gum. Market size and forecast for numerous end-users have been provided in terms of global, and regional level markets. Secondary research sources that are typically referred to include, but are not limited to company websites, annual reports, financial reports, broker reports, investor presentations, SEC filings, internal and external proprietary databases, and relevant patent and regulatory databases such as ICIS, Food Navigator, The United States International Trade Commission, Hoover’s, Factiva and Bloomberg, national government documents, statistical databases, trade journals, market reports, news articles, press releases, and webcasts specific to companies operating in the market. The report comprises profiles of major companies operating in the global xanthan gum market. Key players in the xanthan gum market are Fufeng Group Company Limited, CP Kelco, Archer Daniels Midland Company, Cargill, Inc., Jungbunzlauer Suisse AG, The Aurora Chemical, MeiHua Holdings Group Co., Ltd, Hebei Xinhe Biochemical Co., Ltd., DuPont-Danisco, Deosen, Solvay S.A., The Zoranoc Oilfield Chemical and FMC BioPolymer. Market players have been profiled in terms of attributes such as company overview, financial overview, SWOT analysis, business strategies, and recent developments.